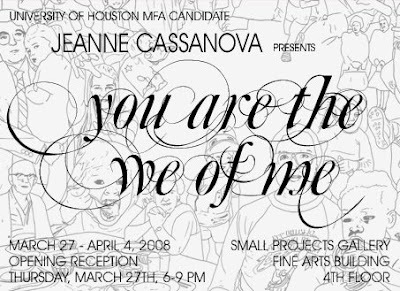 This is an interview with MFA candidate Jeanne Cassanova, whose Project Gallery show is this Thursday, March 27th at the University of Houston, School of Art, 4th Floor. The MFA Exhibit will be April 11th. Click the images to enlarge! First, congratulations on your upcoming graduation. It’s a wonderful accomplishment. Tell us a little bit about what the Project Gallery show is and what it means for an MFA candidate at the University of Houston. The Project Gallery show happens in the last semester of your last year before you get ejected from the MFA program in a tiny pod like in Spaceballs. After spending three years working on bettering your work and your ideas, you get the chance to put together your own mini-show of new and possibly experimental work. While this show is up you submit a written thesis about your work to the professors who will then meet in the Project Gallery with you and give you a chance to defend your thesis. In addition to this process, all MFA candidates get to be included in the group thesis show in the Blaffer. These opportunities are wonderful to me as they represent a climax of the whole MFA experience as well as a chance to share all of the new shiny fetuses of work with the community. What’s the difference between the work you will show in the MFA Thesis Exhibition and the work in the Project Gallery? And how did you make the decision? The Project Gallery space is like a shoe box – about 30 feet deep by 9 feet wide – and the first time I saw the space I promised myself that I would not put any paintings on canvas in there because I knew that my work would look very awkward in that setting. In addition to that, I just assumed that the name of the space – the Small Project Gallery – was an invitation for a specific project that had some connections back to the other body of work – but could go off in new directions and take new chances. For the MFA Thesis Exhibition, I’m including many of the paintings I’ve been working on for the last 2 years that have never even left my studio – they are pale and anemic never having seen sun – they don’t even know what a squirrel is or how a breeze feels on your face. They’ll get that chance now. Your imagery is from a variety of sources which you collage digitally before applying them to your paper and canvas works. Can you explain your process more, and how do you choose the imagery? At the inception of my paintings a digital sketch is born in which hybrid environments and figures are stitched together from multiple found sources. These Frankenstein’s monster-like collages slam together disparate cultures, time periods, classes, belief systems, genders, races, ages and locations while yielding an image that evokes the space of memory and dream. This image is then translated into a line drawing which gets overlaid on top of a meshed pattern of loaded silhouetted signs and symbols pulled from nature, animals, religious ideologies, and icons from cultural heritages all used for their emotive qualities and inherent meanings. My image choice process is rooted in my desire to challenge preconceptions about what is beautiful and what is abnormal. I want to create worlds for the different, the ignored, the shunned, where they will not be forgotten and they will be empathized with. Why do you go through the digital part of the process? How is it important to your work? I look at the digital sketches as a framework or a skeleton that will structure the paintings - just like the poles in a tent helping to hold forms. I can solve many of my compositional, conceptual, and visual problems on the computer in a very easily changeable format and then move to the articulation of the image on the painting with much more confidence with this map in hand. I do stray from the path many times though – trying to give validity to the process of making the painting itself and being present and thinking in front of the canvas as opposed to going into robotic production mode of exact translation of source material. So in the end I have these poles to pitch a tent onto, but as I build it the tarp itself will morph and have holes punched through it and become something other than a tent. But let’s have s’mores anyway, okay? 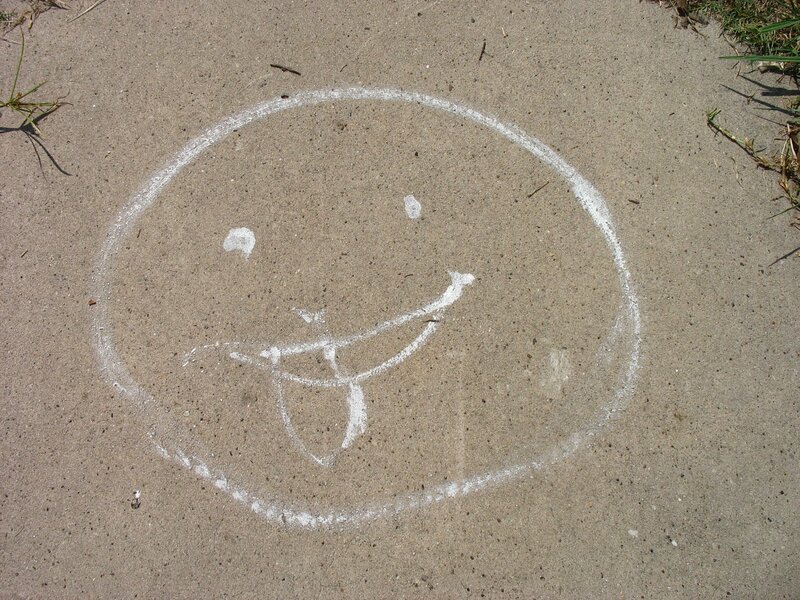 How do you know when you’re done? When have you done enough or too much? I identify with the recent maximalist painting movement in which the surface of a painting is packed in a desire to create an overwhelming, overloaded visual experience. Horizontal as well as vertical layering are techniques employed which bring simultaneous multiple narratives and meanings into a direct relationship with the tactile experience of the tools used in creation. I try to answer the question of enough or too much for my work in regards to whether or not these ideas are resonating. Explain your love of craft material and everything glitter. Here’s your chance to have the last word on all the glitter nay sayers! My paintings are at once tacky, gaudy, beautiful, repulsive, organic, inorganic, boisterous, and quietly frozen. I see my usage of crafty materials such as fabric, glitter, resin and beads in conjunction with an offbeat, sometimes acidic palette functioning as a tactile exploration of merging cultural practices as well as being an overwhelming, over-the-top articulation of exaggerated, individualized life experiences. The surfaces of my canvases act as optically rich flypaper that trap the viewer’s attention and focus upon issues including excess, greed, gluttony, cultural diversity and the surging swing between beauty and disgust. Many artists have been using glitter – it’s nothing new – (Chris Ofili, Lari Pittman); for me the material ties into my ideas for the work in that glitter emblazons, decorates, shows reverence for what it is put on, all the while being nothing more than cheap sparkly plastic – this dichotomy matches the tension between beauty and ugliness in the paintings. As a child I would watch my older sister carefully organize and decorate her absolutely amazing Sticker Book. I would sometimes have the luxury of holding it, smelling the vinyl, pouring over the themed pages, absorbing the puffy glitter stickers and have moments of spiritual ecstasy. It was the most beautiful thing I’d ever seen – the candy-colored graphics, the sparkle of the plastic, the unending possibilities of adding more and more – filling up all the pages, packing all the space to make it the best, and the oddity of Princess Leah, Alf, and the Garbage Pail Kids all living together. I think I’ve been trying to recreate the beauty and meaningfulness of that Sticker Book in my work for a while now – and that’s why glitter. They are the perfect embodiment of an overlooked, often ignored person whose aging body and closeness to death is deemed by our society to be ugly or embarrassing. To me they are beautiful for just that – their housecoats, diamond encrusted reading glasses, rolled knee-highs and wrinkled hands crinkling candy wrappers all comforting invitations to their stories, their experiences – invitations to empathize and find beauty in something different that we will all become one day – an ‘old person’. C'mon and let me live, girl! Customer Needs Assistance, graphite on paper, dimensions 22"x30"
Finally, for the past three years you’ve gone through quite a journey with your art. Fill us in on your feelings now as you look back at your progress. What do you feel about your work and yourself as an artist then and now? Sometimes the most important things are actually those things that you are willing to lose. I learned that pretty quickly three years ago when I moved here from my home of New Orleans to start the MFA program at UH a month before Katrina. I’ve never seen so much loss in my life and the aftermath of that experience was reevaluation, reprioritization, and regrowth. Those three elements permeated my work as well – I was open to losing all the parts of my work that I had been using previously in hopes of really pushing forward. In the end the things that I lost were so important in that they allowed the things that I couldn’t lose to bubble up to the top and become even dearer to me.